This cheese is created using a mixture of morning and evening milk, hence the name, Double Gloucester. It is a traditional, semi-hard cheese which in this case is made by Applebys in Cheshire as we found this to be one of the best.First mentioned in the sixteenth century. Medium to strong flavour depending on age. Made with unpasteurised cows milk and suitable for Vegetarians. An unpasteurised cow's milk cheese from Baylham. Firm with a slight crumbliness. 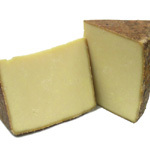 Similar to a Cheddar/Cheshire mix. Mild to medium flavour. Made to a traditional family recipe by Carron Lodge Dairy with unpasteurised cows milk. 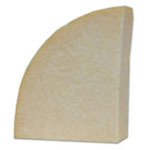 A full flavoured and fine textured Lancashire cheese from Preston. 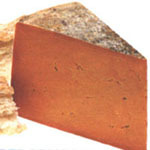 Red Leicester is a rich, russet coloured cheese. The colour was largely responsible for the cheese's popularity - especially in the Victorian period - and is caused by the use of Annatto, a tasteless vegetable dye extracted from a plant in South America. With a firm body and a close flaky texture, it takes around four and a half months to mature. Made with pasteurised cows milk. Made using milk from their herd of 200 Holstein cows.The cheese is matured for 12-24 months until the right maturity level is reached. A full flavoured cheddar type cheese. Very popular. Silver at The World Cheeses Awards 2005.Made with pasteurised cows milk. This cheese will be in short supply until the end of August. Please call 01206 572200 for availability. 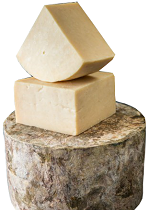 Made in Wells with unpasteurised milk, this hard cheese has a nutty and full flavour similar to a Gruyere. Each cheese is matured for at least 6 months. Suitable for Vegetarians. An pasteurised ewes milk Brie style cheese handmade at Willow Farm, Wymondham. Full flavoured and creamy. Suitable for Vegetarians. A fresh goat cheese from Salisbury that is available both plain and covered in herbs. This is the plain version which is mild and lactic. Made with pasteurised goats milk and suitable for Vegetarians.